It was the last night of the 30 taco trucks in 30 days challenge and barring some unforeseen circumstances I was going to complete it. During the last 30 days I gave up beer (and all alcohol). There were two reasons for this ;If I was going to overindulge with one vice then I had to restrain from another. But more importantly I knew that there was a good chance I would go out to the pub, drink one too many, and forget to blog. I would fail the challenge and be the laughing stock of the internets. So as much as I wanted to finish the challenge I was equally looking forward to my first pint of lager in a month. I drove out of downtown and took Sunset Blvd. The plan was to go to Tacos Arizas on Logan and Sunset. 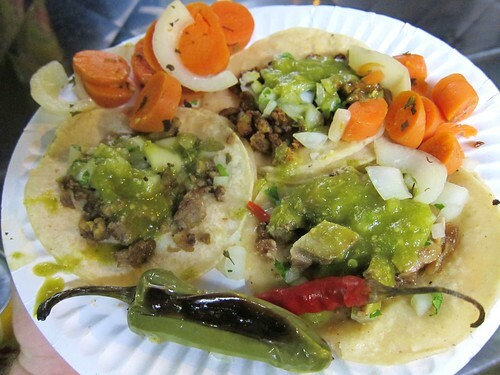 I’ve never reviewed Tacos Arizas for the blog but had been there a few years ago. 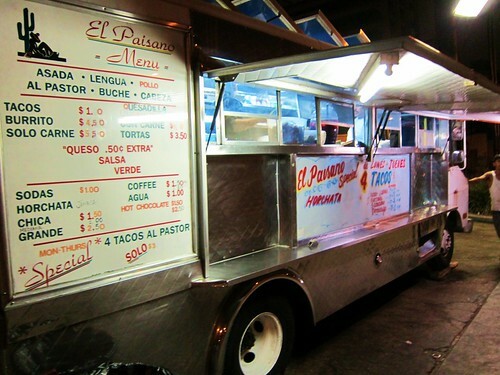 But then I saw El Paisano, a truck that parks at the corner of Sunset and Boylston and remembered that someone had suggested it recently. I ordered al pastor, carne asada, and lengua. The tacos came topped with onions, cilantro, and a spicy salsa verde. They didn’t have jarritos which was disappointing. Every truck should have jarritos. The lengua may have been the best tongue taco I’ve had ever. A lot of lengua has a waxy texture and a gamey aftertaste. 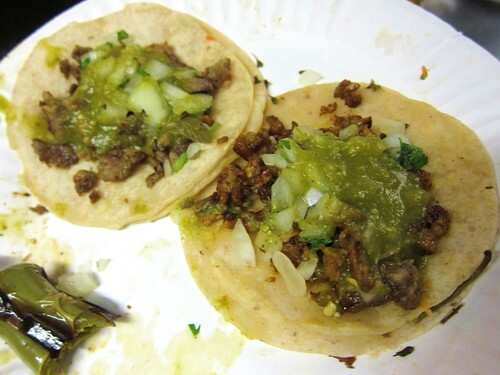 I’ve had a lot of bad lengua ; it can be rubbery, fatty, flabby, gross - pick the adjective. But this lengua was soft and tender with subtle beef taste and little hints of exotic flavor. It was paired with the excellent spicy salsa verde. The carne asada and al pastor were finely chopped and had good flavor but the real star was the salsa verde which was a blend of jalapeno and tomatillo. The salsa verde was hot and had my lips humming with little beads of sweet forming on my temple. I’ve made this kind of salsa at home before - it’s mostly just blended jalapenos with a few tomatillos tossed in for balance. The al pastor wasn’t from the trompo. I probably wouldn’t include it on my plate next time at El Paisano. After eating my tacos I got back in my car and cruised down Sunset Blvd until I got to Alvarado. I was tempted to turn right and go to the Taco Zone truck. It had been a few years since I had tried the truck most beloved by Silverlake and Echo Park hipsters. But there would be plenty of other nights for Taco Zone. I needed to get home and write this review. And that pint of Stella was sounding pretty good too. This concludes 30 taco trucks in 30 days. Thanks for reading. I think this truck is supposed to be known for their Horchata. That's probably why they don't have Jarritos. The horchata here is pretty strong with the cinnamon and it is a bit chalky. 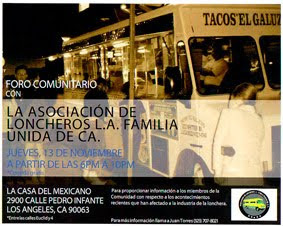 Nearby, very nearby, there's a taco stand that sets up on Friday/Saturday/Sunday evenings. They have very good lengua. It's on Bellevue and Leveta Terrace. Just turn into Marion, which is the closest signal light to El Paisano, and it turns into Bellevue. Tacos are $1.25 but they are very generous with their portions. You should try their quesadilla too. At $2.50 it's packed with meat. This is easily my favorite taco joint out of all the places I've tried so far. Congrats on 30 for 30! 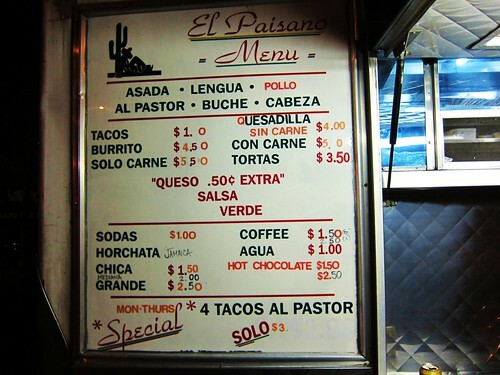 I was the guy who recommended El Paisano. The 4 al pastor for $3 special can't be beat. I really miss living across the street from these guys. Arizas is good too, would love to see a writeup on them. Congratulations, Bandini. September 2010 goes down in taco history. I enjoyed reading your 30 day adventure... Thanks for posting it, and you're right - all trucks should have Jarritos! Interesting description of the lengua Bandini. Never thought it can be (or should be) crispy but.. interesting nonetheless. Amazing diligence to pull this off. Major kudos.